The nature of migration from Africa to Europe across the Mediterranean is changing. Some sub-Saharan African migrants are adjusting their routes due to dangers in Libya, and Tunisian migrants are leaving their country in greater numbers than before. These trends are however unconnected. Few sub-Saharan migrants pass through Tunisia heading for Europe, but Tunisia could nevertheless face the issue of transit migration in future. To prepare for this, the country urgently needs a strategic, comprehensive and open policy debate on how it will handle the issue. Over the past year, the number of irregular migrants intercepted by the Italian Ministry of Interior has fallen. A total of 94 802 migrants were recorded in the first seven months of 2017, but only 18 510 arrived during the same period in 2018. The cause of this decline lies in western Libya, where agreements to limit migration were struck between European states, local militias and local smuggling networks. While the number of migrants departing Libya has dropped, the number of those leaving Tunisia’s shores for Italy has increased to levels not seen since 2011. In a few weeks in 2017, more people took to the seas than in 2015 and 2016 combined. So far this year, Italian and Tunisian authorities have intercepted at least 6 800 migrants coming from the country. Tunisian nationals comprise a fifth of total migration across the central Mediterranean. The geographic proximity of these two phenomena has created a perception that they are linked – that the increase in migration out of Tunisia represents a displacement of sub-Saharan migrants from Libya. However this is not the case. Most migrants moving from Tunisia to Italy are Tunisians. To date, Tunisian authorities have arrested 3 243 irregular migrants, 2 952 of whom were Tunisian. Only 208 were citizens of sub-Saharan African countries. 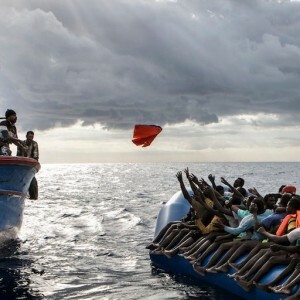 When sub-Saharan migrants are encountered at sea, they tend to be aboard boats filled with Tunisians. There is little indication that smuggling networks focusing primarily on sub-Saharan Africans have emerged in Tunisia. There is also little indication that sub-Saharan migrants from Libya are attempting to come into Tunisia in large numbers. Tunisian authorities do intercept some groups of irregular migrants coming from Libya and Algeria. However, the groups are small – typically two to 10 people – and their arrival is intermittent rather than routine. The limited use of Tunisia by foreign migrants as a transit point to Europe despite a rapidly increasing domestic migration wave is probably due to three factors. First, the number of irregular migrants already in Tunisia is fairly small, believed to be far below the 100 000 migrants in Algeria or 50 000 in Morocco. This has probably limited the number of people who could engage with Tunisian human smuggling networks as the volume of boats departing from Tunisia has risen. For a large number of non-Tunisian migrants to depart from Tunisia, they would first have to make it into the country. This leads to the second factor: it’s hard for foreign migrants to enter Tunisia clandestinely. Tunisia’s government has adopted a comprehensive approach to buttressing its border security. Though motivated by worries over terrorism, the initiative has had a larger effect on the far more routine transit of contraband goods and irregular migrants. While individual irregular migrants can probably still enter Tunisia undetected, the feasibility of large groups doing this is extremely unlikely. Finally, the tolerance of Tunisian officials towards irregular migration differs based on nationality. While Tunisian authorities arrested 7 325 Tunisian irregular migrants in 2017 and the first eight months of 2018, Italian authorities intercepted 9 869. The number of Tunisians reaching Europe hints that there is a degree of unofficial tolerance of the phenomenon. At least one investigation in Tunisia is looking into accusations of complicity between smugglers and security officials. Unofficial tolerance of Tunisian irregular migration is a continuation of older trends from the era of former president Zine El Abidine Ben Ali. This type of migration provides stability and economic benefits to the state by offering an outlet to unemployed young men and enabling the return of remittance flows. Meanwhile, the departure of non-Tunisian migrants from the country brings few benefits to the state. Its impact is primarily negative, risking diplomatic tensions with Europe. So officials who may informally tolerate some degree of Tunisian migration are less likely to extend this tolerance to the migration of foreigners. While the factors that have prevented Tunisia from becoming a transit migration route are significant, they are not unchangeable. The current situation depends on the ability and will of the security forces to control the borders and departure zones. A serious political or economic crisis prompting instability in Tunisia could well change the situation. This has already happened once, albeit with the migration of Tunisians rather than foreigners. In the wake of Tunisia’s 2011 revolution, lessened security force pressure enabled nearly 30 000 migrants to set off towards Italy. Tunisia needs an open policy debate on how it wants to handle the issue of transit migration. Sound, proactive policy should be developed before incidents and crises arise. A lack of attention could have serious humanitarian consequences.